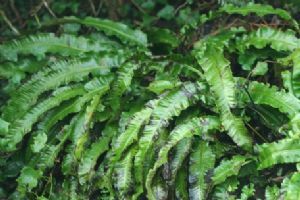 The old name for a deer was a 'Hart' and so the name of this native British fern comes from the shape of a deer's tongue; unusual amongst ferns in having a solid leaf that makes a nice contrast with the more feathery kinds in a 'fernery'. It likes lime or neutral soils and damp shade. Here one small plant from my father's farm in Somerset, planted between old logs at the base of a tree in my Welsh garden, has spread to 3 plants covering over a couple of metres in 3 years.